Every team believes it can win an NCAA tournament game, but how do they remember those matchups in hindsight? Greg Lewis felt confident going into Selection Sunday in 2002. The senior forward and his Winthrop Eagles were entering their third straight NCAA tournament as Big South champions. Although they had lost to Oklahoma as a No. 14 seed in 2000 and in the play-in game to No. 16 seed Northwestern State in 2001, Lewis thought his career had been building toward one big upset. Then Lewis heard who Winthrop’s opponent would be: defending national champion and No. 1 seed Duke. The Blue Devils featured eventual player of the year Jay Williams, along with Carlos Boozer, Chris Duhon and Mike Dunleavy, but the Eagles were on a six-game winning streak and had no plans of rolling over. When the final buzzer sounded, though, Winthrop had lost 84–37. Welcome to life as a No. 16 seed. 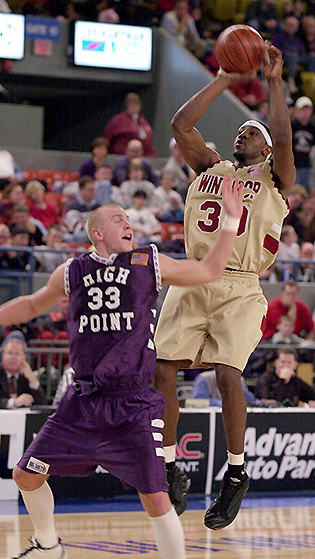 Chances are you don’t remember the 2002 Winthrop Eagles, but there are many teams like them. Every March, heroes emerge from unexpected corners. But for every Valparaiso, George Mason and Florida Gulf Coast, there are two or three teams that don’t have any shining moments. Edwards accomplished that goal his senior year, winning the Mid-Continent Conference tournament to claim the Raiders’ first ever trip to the NCAA tourney. Their reward was a first-round matchup against Bobby Knight’s top-seeded Indiana Hoosiers, a team that featured Naismith Player of the Year Calbert Cheaney and returned its four leading scorers from the 1992 Final Four team. Edwards scored 18 points, but his team lost 97–54. His Delta Devils flew all the way to Anaheim, Calif., where they were waxed by No. 1 seed UCLA. Kevin Love, Russell Westbrook and co. beat them 70–29. Those 29 points remain the fewest any team has scored in a tournament game since the 1940s. Since the men’s tournament expanded to 64 teams in 1985, there had been 124 matchups between a No. 1 seed and a No. 16 (going into this year’s tournament). The favorites are 124–0, and more of those games have been decided by 40-plus points than have been kept within single digits. While close calls do occasionally arise, the talent gap between a No. 1 and No. 16 is often simply too wide for a competitive game. Lucas has similar memories: “I ended up running out on Darren Collison and he blew by me like I wasn’t even there,” he said. He also laughs now about a hard foul he committed against Kevin Love, which he says drew a lot of boos. Getting crushed by future NBA stars often results in mixed feelings. Lucas regrets that he didn’t play more aggressively, because his team was trying to slow down the tempo. “I didn’t play my game,” he says now. For many mid-major players, just sharing the court with those storied programs was a reward for a successful season. Edwards had a similar experience. “Coach Knight called me over, shook my hand and said I was a good player,” he said. The compliment stuck with him. Edwards played in three NBA games for the Philadelphia 76ers and then played pro ball for more than a decade overseas. He still counts that moment with Knight—after fouling out of a 43-point loss—as one of his career highlights. He played pro ball in countries all over the world, but said he still has pictures from that Duke game at home. Lucas is now a math teacher and the head basketball coach at his alma mater, Simmons High School in Hollandale, Miss. Scoring only 29 points still stings a little, but he laughs about it—at least he’s in the record books, he’ll say. His players ask about his career and he gets some extra credit for having faced Love and Westbrook. And it’s a talking point to deliver for his guys in western Mississippi, in a town about 250 miles north of New Orleans. “Just because you’re from a small town doesn’t mean you can’t do big things,” he said. His oldest son, Bill Edwards Jr., played at Penn State and then Miami (Ohio) from 2010 to 2014, but never reached the Big Dance. His second son Vince is a sophomore forward at Purdue, who got his second crack at the tournament this year. Last year his Boilermakers lost to No. 8 seed Cincinnati in overtime by a single point. This year they fell to No. 12 seed Little Rock in double overtime. But whether a team loses in overtime or by 40 points, whether it’s remembered or ultimately forgotten, the players who participate in March Madness are all left with stories for the rest of their lives.